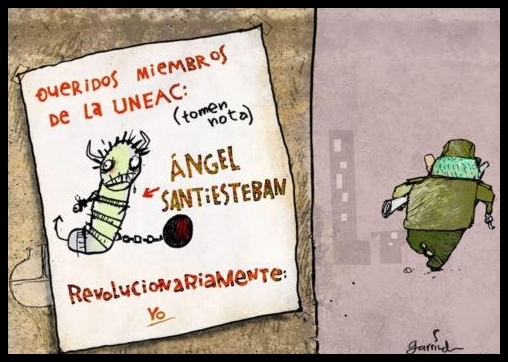 Once again, the official intellectuals are summoned to “participate” in another Congress of the Union of Writers and Artists of Cuba (UNEAC), to be used as political reaffirmation for the Regime, since they won’t do anything else, the same as on previous occasions. Some will bleed for their suffering, the officials will pretend to listen, and it will even appear that something will be done in this regard, when the reality is that they will forget the problems, and they will remain only in the memory of those who are present. The dictatorship, as it always does, will allow the media to publish or televise some sentimental intervention, to make us believe that it has been a space for free debate, and thus hide the hand of censorship that they constantly apply to us. Those elected know that they would never be able to say what they hide, their true thinking with respect to the dictatorship, and as in a double game, they will also pretend that the first task is to save the culture, when in practice they only save their lifetime stay in power. Those intellectuals — the majority — entered into the process when they were very young; today they are a litter of oldsters brought to heel who ooze from the wounds made by Fidel Castro and who have overcome profound humiliations: they carried out cynical condemnations and then couldn’t appear physically in society. I remember when in the “war of the emails” — as a result of some negative characters returning to public view, repressors in the cultural sector in the ’70s — the majority of intellectuals attacked that possibility, and when the government understood that the protest was growing, they ordered the ringmaster, Abel Prieto, to block the bulls, and that they be the ones who watch the affair. There were hundreds of letters, first nationally and then from every corner of the planet where there was a Cuban who had been harmed by those people. No one ever said that the guiltiest of all was Fidel Castro. They only permitted themselves to judge the people, pure fallen trees that already weren’t of interest to the State, like the comandante Papito Serguera and Luis Pavón, among others. I dared to say, in my only email that I dedicated to the matter, that we do nothing by condemning the officials who were removed suddenly, when the intellectual author, Fidel Castro, was still in power, that those who they attacked now were no more than repressors, executioners who executed under the orders of the Castro brothers. Now they had to endure the pretense that they, omnipotent leaders, didn’t know about the purges in the cultural sector, the persecution of homosexuals or artists who shaped some critical revelations in their work. The intellectuals – even in their letters – were not capable of questioning the centers of Military Units to Aid Production (UMAP). They played their false roles of bulls seated on the steps while they watched the master of the toreros in the ring and the firefighter in the cultural sector, Abel Prieto, manipulate the affair behind closed doors with some conferences, to drain once and for all the spiteful feelings provoked by the constant reactions. It will be another congress without solid contributions to the cultural process that strengthens the cultural sector. Lawton Prison Settlement. April 2014. Please follow the link and sign the petition so that Amnesty International declare the dissident Cuban Angel Santiesteban a prisoner of conscience. When the 20 convicts who accompany me go out on pass for family reunions, I send them off with the joy that spreads to me from their happy faces. They are barely gone when I plunge myself into literature. Nothing will hurt my exorbitant creation, not even the knowledge that they will deny me the passes I should get according to the Penal Code. They return to violating my rights, now as a prisoner serving a wrongful conviction. How could I be bored with the quantity of work that awaits me? I remember that night of November 8, 2012, when we were arrested and taken away by the Santiago de Vegas police, after being beaten in front of the police station of Acosta, where we were demonstrating our disagreement with the unjust detention of Antonio Rodiles. Sharing a cell with the dissident Eugenio Leal, they released me at midnight, but scarcely had I advanced 100 meters when in the darkness of that road–and like a childish game–some seven guards who were waiting for me surged from behind the bushes to announce that I had to return to the cell. I did it happily, since my brothers in struggle remained there, and I felt humiliated at having been the only one to be set free. Now neither do they notice in me any anxiety, except that which provokes me to want freedom for the prisoners of conscience that today they keep in different prisons throughout the island, the dream of democracy with the disappearance of the totalitarian regime, and free literary creation. Outside of that, nothing drives away my peace. I am happy in this life because I have learned that I want to struggle even with my fingernails; it’s the way to grapple with the need to comply with our conscience, feelings, family education and patriotic readings. All that impels me to leave the path of masks with which an artist can live in a dictatorship. I simply ripped up the immorality with which you survive in the Regime, and I decided to renounce everything I had obtained. I presumed a pure honest talent. Beginning then, of course, I received the answer that totalitarian regimes have for these cases: first the threats, later the direct rebuff, beatings, fractures, censorship, the diabolic mechanism of the “injustice” of the organs of State Security, hidden behind courts that answer to their designs, and, finally, prison. All that has only served more to multiply all my strengths, hopes, dreams, and my creativity. Now I am more conscious of the need for my country to attain the rights proclaimed by the United Nations in the Universal Declaration of Human Rights, whose Pacts the Regime still hasn’t ratified in spite of having obtained a seat on the Human Rights Council of the United Nations. The solitude of the barracks is a great stimulus for dedicating myself to writing, and the constant vigilance of the uniforms around me adds to my verve. I know they are beaten because they search for a way to get rid of my power without receiving punishment for their offenses. Have Amnesty International declare the dissident Cuban Angel Santiesteban a prisoner of conscience. To sign the petition, follow the link. 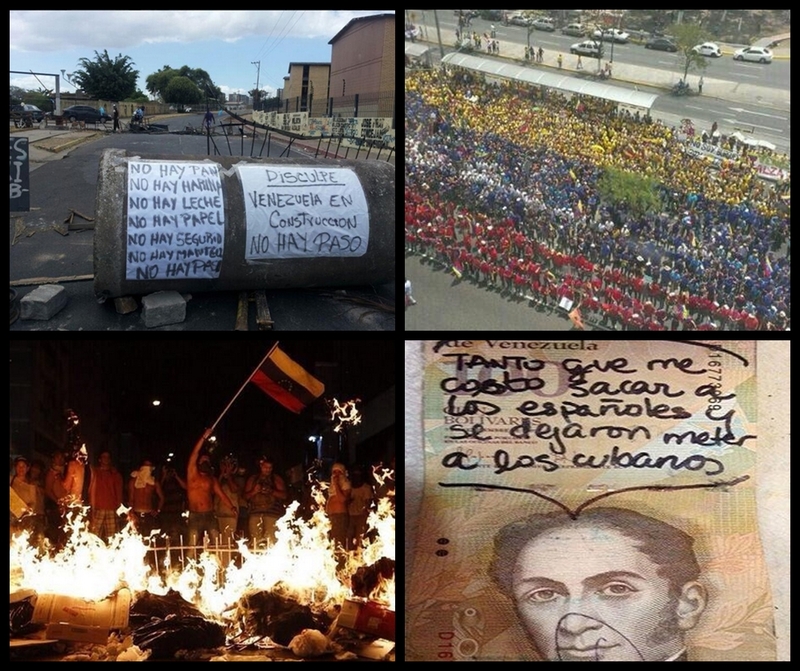 The hypocritical “conversation” that Nicolas Maduro held with the opposition indicates the political temperature of what is happening in Venezuela. Against his will, the dictator sat down at the table of dialogue. Although he does not want to recognize it, he did it at the demand of his Cuban advisors, and of Raul Castro himself, who in frequent phone calls from the Island, advises him not to give up, or show weakness or that he is desperate because of social pressure. It is true that in Cuba Raul Castro is far from recognizing his political adversaries; further away still is the possibility of a dialogue between both sides. Many more Cubans will have to die before — at some point — we throw ourselves into the streets in order to demand what belongs to us by right and that they have stolen from us for more than half a century. Circumstances, dictators and tyrannies are different, but on perceiving that the process imposed by the deceased Hugo Chavez is extinguished, and in spite of the power and abuses they make a disillusioned people suffer, they have also make them pay for their rebellion with more than 40 lives. In order to avoid guarimbas (street clashes) in Cuba, the Castros have maintained their iron command, which has cost many lives of those who have opposed them. Here, if one breathes at a different rhythm than that stipulated by the leadership, the political police open a file and begin their constant persecution, waiting for you to breathe deeply to “bring you” your shares of anguish. No fire is needed in the archipelago; the smoke of a lit match barely suffices to sound the alarm. Nevertheless, we keep dreaming of our guarimbas. To sign the petition for Amnesty International to declare dissident Cuban Angel Santesteban a prisoner of conscience, follow the link. “Honor to those who deserve it,” said our José Martí, anticipating my mother, who inculcated in my education the culture of gratitude. Many at the start of my imprisonment have stayed at my side in this passage that has lasted more than a year; but Reporters without Borders has been the most outstanding, when, from the beginning, after reading all my proofs presented in the alleged “trial” that they carried out, and later augmented in the Review, they decided to support me without flinching one iota in my defense. In a personal letter, where I also thanked them for their honest and brave stance, I described to them the feeling that embraces us when, from the darkest cell, behind bars, abused by the henchmen of the dictatorship, we get a sign of encouragement from the organization that you lead, calling on the totalitarian President of State to restore the rights that were taken away. In my personal case, it provided me this extra strength, after two weeks in the hole on a hunger strike, that made me feel happy for what I do although they advised me and begged that I consider my life first and never choose starvation as a way of struggle. 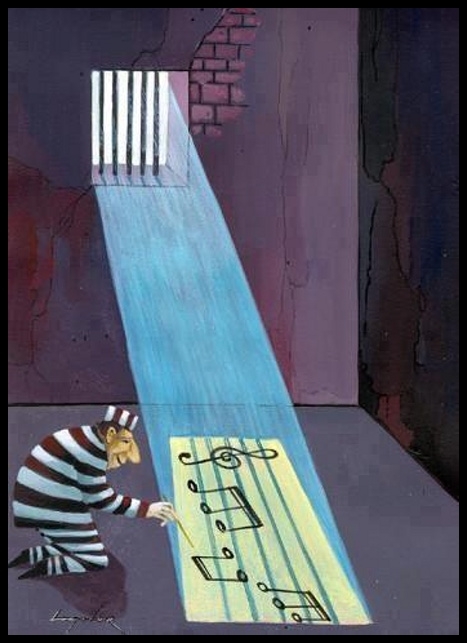 In spite of the suffering of being deprived of the most valuable thing for a human being, freedom, and of missing our families and the free consumption of art, we feel worthy of such luck, if the state without rights persists in our faces. I want a country without censorship, and when that happens, we will be living a new political, social and cultural stage, for the Cuba we need to build with the force of everyone. Until then, a grateful hug to you and your work team, especially to the warm and selfless work of Camille Soulier and Lucie Morillon, always attentive to what is happening on our continent with the lamentable regression in the matter of freedom of expression and the persecution of professionals of information, particularly their compromise with Cuban journalists. All your work is laudable and fundamental for the quest for personal and civic liberties of those of us who humbly wish to contribute a light of truth from the center of total darkness. So that Amnesty International declare the dissident Cuban Angel Santiesteban a prisoner of conscience, please follow the link to sign the petition. 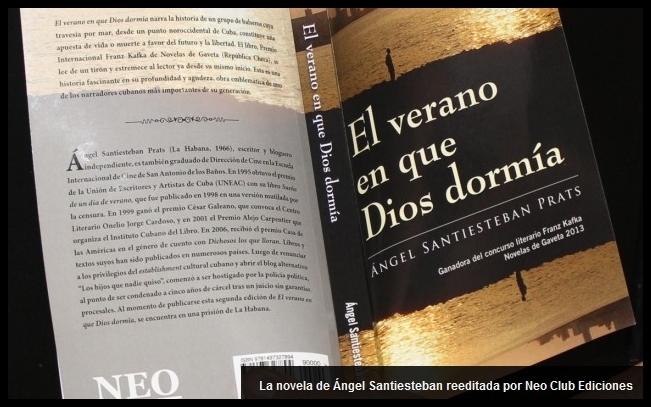 I have the pleasure to announce that my work, which won the 2013 International Franz Kafka Novels From the Drawer Prize 2013, “The Summer when God Slept,” will be reprinted in coming weeks by Neo Club Editions, an independent publisher located in Miami and directed by the Cuban writer Armando Añel. Owing to the fact that the original edition, printed in the Czech Republic, according to the rules established for the award, is destined for the Cuban reader on the island, I agreed with Neo Club Editions to make this second edition, which will consist of a greater number of copies, with the idea of reaching what I consider, in addition to Cuba, natural markets for my work: Miami and Spain. The book, furthermore, will be available in ebook format and paperback through Amazon’s channels of international distribution. 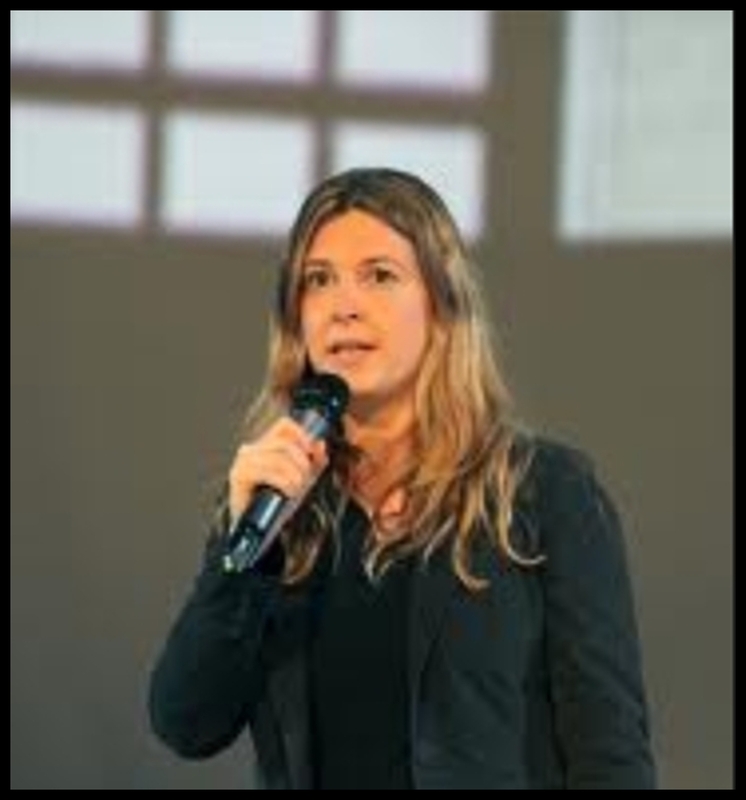 Idabell Rosales – president of Neo Club Editions – together with Armando Añel, heads this project so that those of us who are censored and excluded for political reasons from cultural promotion in Cuba can publish our works in freedom and let them be known outside our country. Thanks to this important and necessary idea, for example, a door has been opened wider to international promotion of the poetry of the writer Rafael Vilches Proenza, a friend enraged by the repression, which already on two occasions threw out works that he had in cultural institutions in Holguín and Santa Clara. The publication of the beautiful poem, “Café Amargo” (“Bitter Coffee”), besides rescuing the work of a writer censured for not bowing to official impositions, is an act of literary justice for one of the most outstanding poets of my generation. I will celebrate – thanks to the project and the generosity of Armando and Idabell – that my novel will be able to be read in the rest of the world, the same as the valuable Cuban literary production of Cuban writers in exile that Neo Club Editions includes in its catalogue. Have Amnesty International declare the dissident Cuban Angel Santiesteban a prisoner of conscience. Previously I have said that in the circus exercise called court, which I attended with the sentence already dictated by State Security, as I was made to know long before by one of their henchmen, a fact that I made known publicly — and which the judges in the First Chamber of Crimes Against State Security executed, in their special headquarters for notorious crimes on Carmen and Juan Delgado, when it was supposed that my crime was common — officials of the Cuban Artists and Writers Union (UNEAC) attended, sent by their president Miguel Barnet to watch the show, like poet Alex Pausides, accompanied by the legal official, who said that to his understanding what the prosecution could present against me was smoke, like the report of that handwriting expert who said that the height and slant of my handwriting made me guilty. At the exit, the poet and Communist Party member Alex Pausides as well as the legal official, said that I would be absolved given that what was presented, and according to what was exposed in the oral ceremony, I could not be judged, especially when I presented five witnesses who demolished those accusations. Then, when they found me guilty, my lawyer went to UNEAC and left all the documents that corroborated my innocence and that they requested for presentation to Miguel Barnet, but we never received an answer, they kept silent. Of course, I am not naive, I never expected a reaction from UNEAC, I always knew what they would do, but above all, what they would not do, and they have fulfilled my predictions. I understood that they would take that posture because I believe in history like a religion, and I knew that history would yield that despicable stance. Their silence is their shamelessness. And that shamelessness is now written in our history. To sign the petition for Amnesty International to declare Cuban dissident Angel Santiesteban a prisoner of conscience follow the link. The dictator Raul Castro continues stubbornly to make the world believe that he’s bringing to Cuba an opening that in reality doesn’t exist. He continues being the same dictator as always, violating the rights of all Cubans, submitting them to misery, censoring the press, harassing, beating and imprisoning peaceful opponents. 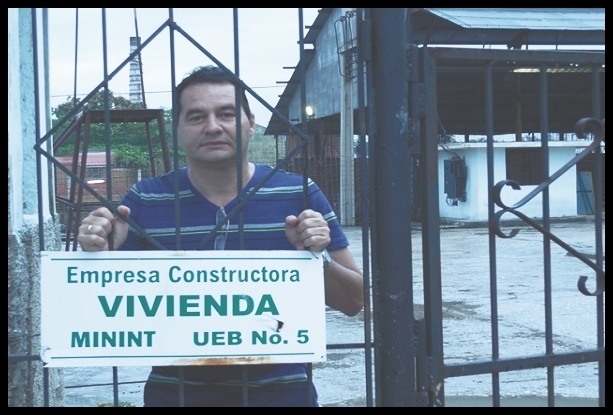 Angel Santiesteban, unjustly imprisoned, has completed one year after a rigged trial for some crimes that his ex-wife and mother of his son invented together with the political police. They sought to silence his critical voice against the dictatorship, but they have not succeeded. 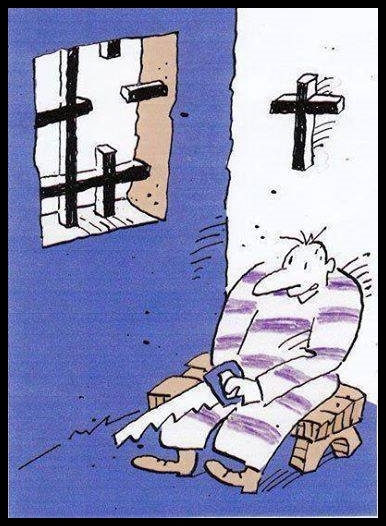 No punishment, beatings or prison itself has made a dent in him. And by keeping him locked up, the dictator hasn’t prevented his literature from continuing to be recognized in the world, which condemns the injustice against him. 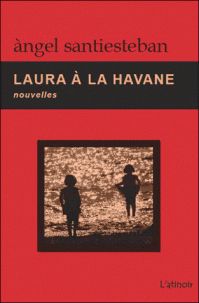 Again in France, this time in Marseille, his book of stories, “Laura in Havana”, published in 2012 by L’Atinoir, will be presented before the public. Raul Castro continues violating his own law, taking away Angel’s passes that he is supposed to get every sixty days. It doesn’t matter to Angel, because when his companions go to visit their families, he takes even more advantage of the time and the calm to continue writing. We invite you to a convivial meeting with Jacques Aubergy and Rasky Beldjoudi, Saturday, April 12, at 5:00 p.m. at the Maison Pour Tous de la Belle de Mai (House For All of the Belle of May). Jacques Aubergy is a translator, bookseller and publisher. His publishing house, L’Atinoir, publishes authors of noir fiction and Latin American writers. He will speak to us of his trade, how he chooses his books, and will make us know intimately and with passion some marvels of Latin American literature chosen by him. He will also present the book, “Laura in Havana,” a collection of ten short stories by Angel Santiesteban-Prats, published by Atinoir. 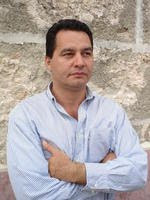 Angel Santiesteban Prats is one of the greatest Cuban authors, presently in prison after having openly criticized his country’s system. 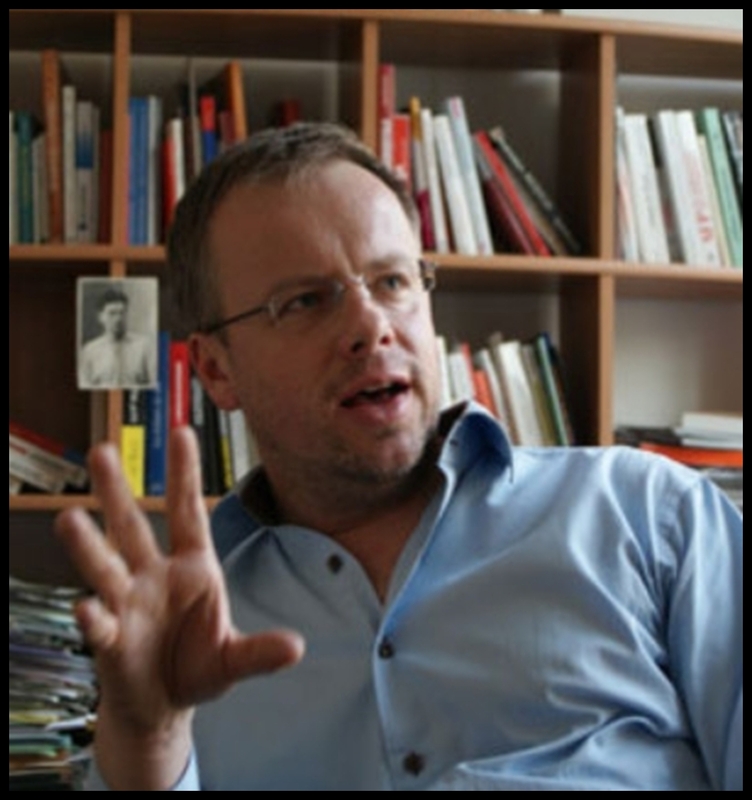 His imprisonment has generated strong support from Reporters Without Borders and the world-wide community of bloggers. “The Eleventh Commandment” is a book by Rasky Beldjoudi, a resident of the Belle de Mai. The name Rasky Beldjoudi will surely mean nothing in particlar to you. You have never noticed him, although it’s very probable that you have already seen him on Caffo Square or perhaps, one day, sitting next to you on bus 32. However, Rasky is impressive, muscular, and his Belgian accent with a Kabyle (Berber) accent leaves no one indifferent. Since his infancy, Rasky has accumulated difficulties. From scholastic failures to precarious employment, he knew years of struggle and the hell of drugs. In spite of an uneven road and a life story that is sometimes not very glorious, he succeeded in rising above the circumstances of his life and has just published “The Eleventh Commandment”: an enthralling autobiography, written in a remarkable style, full of humanity, and unbelievably touching. Saturday, April 12 at 5:00 p.m. Event organized by Brouettes & Compagnie, the association CIN-CO and the Maison Pour Tous de la Belle de Mai. Angel Santiesteban Prats dedicates this article to Guillermo Vidal, to remember the tenth anniversary of his death. He wrote it from the Lawton Prison Settlement for the column “Some Write” from the digital magazine “OtroLunes” (“Another Monday”). It’s always a pleasure to remember Guillermo Vidal. Sharing with him the adventure of writing has been one of the great rewards that life has offered me. His sympathy, modesty and talent seasoned his conversations. He was a man called to make friends, easy to like, and always persecuted by injustice, since they never could make him bow down. He maintained his literature at a high price, because he didn’t yield even one iota of his level of social criticism. When they expelled him as a professor from the university, they didn’t even ask how he was going to live or maintain his family. Being despised and marginalized by the government of his territory in Las Tunas, by the demand of the political police, he became himself. He was part of an intellectual existence that he accepted with stoicism, without complaint, which he endured in solitude and repaid with brilliant writing. That was his revenge. After treating him like the plague for many years, the government offered a tribute to an official writer, and we agreed to attend if Guille would be among those invited. 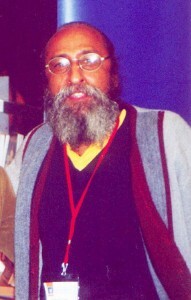 Once there, in the seat of the Provincial Party, in the same lair as the dictatorship, one of us said publicly that our presence had no other end but to lionize Guillermo Vidal, the most important living writer of Las Tunas, and one of the most important in the country; that it was a way of supporting him and demonstrating our friendship. The government functionaries and those in charge of culture opened their eyes, surprised by the audacity. Those were the times when we still had not gained some rights that we have now, and where for much less than what is done today, there were immediate reprisals. What is certain is that on that night and in the following days, we felt like better people and better intellectuals for showing our solidarity with him. Later he let us know that, from that moment, things got better for him. He stopped being banned and persecuted, because the authorities feared his contacts in the country, especially in Havana. Now that we are on the eve of another congress of UNEAC (National Union of Writers and Artists of Cuba), I remember what happened during the decade of the ’90s. After the vote to name the officers, Professor Ana Cairo, the officer of the Roger Avila Association of Writers, and I counted the votes, and there were a surprising number of artists who voted for Guillermo Vidal. No one else had as many votes; no one even came close. However, later, when I saw who they elected, I understood that the votes were only a game, because Abel Prieto determined the election. They didn’t give any commission to Guillermo Vidal, not even in his own province. He was cursed, on the list of the marginalized. When he died, it caused an infinite sadness, impossible to describe. I called the Institute of the Book (ICL), since I knew that they would have transport to take writers who wanted to participate in his burial. The Taliban Iroel Sanchez, at that time the President of this institution, assured me that the microbus already had seats assigned. Of course, he was lying to me, and I intuited that in his words. Later, those who made the trip in that transport told me that not all the seats were taken. I regretted very much not being able to say goodbye to him in that last moment. They feared that the truth would come out: that they had condemned him in life by closing all the doors to him that he knew his literature, a stroke of talent, would win. Surely I would have said that. You can’t talk about Cuban literature at the end of the 20th century without mentioning the genres of the short story and the novel. However, in spite of the human misery that surrounded him, and the material poverty they obliged him to suffer, his genius at being a good Cuban jokester is the first thing that comes to mind when we think about him. That’s how I want to remember him now. He had a spectacular snore. It almost loosened the nails from the beams and raised the roof. When you approached his room, the first sensation was that there was a roaring lion inside. The result? No one wanted to share a room with him. Once, late in the night in Ciego de Avila, I met another writer from Las Tunas, Carlos Esquivel, literally crying in the lobby of the hotel because he couldn’t manage to sleep with those snorts. When I described this scene the next day to Guillermo, he laughed like a naughty child. He asked me to repeat the story so he could continue to amuse himself, and he called for the others to listen to what suffering he was capable of inflicting, unconsciously. In one of the prizes he won, and there were several, he had the luck to receive dollars. Then we got a telephone call saying that he was a relative of Rockefeller, and that he was ready to share his fortune; thus, he was generous. Certainly, in those few months I didn’t have a cent, and he continued in his material poverty. No one except his friends and spouse could believe him. At one book fair in Guadalajara he told me that sometimes he had the impression that the government permitted him to leave to see if he stayed and they would get rid of him, and he laughed imagining the faces of the functionaries when they saw him return. In one of his visits to Havana, he confessed to me how surprised he was because another writer told him that he envied him, and he couldn’t conceive of being anyone to envy, and he laughed. “When I go home from the university, at high noon, the cars pass me and no one gives me a ride, and they leave me wrapped in dust to the point that I stop breathing so I don’t swallow the dust,” he said, and he began to laugh. Then I told him that I would exchange all that poverty for his books, that I also envied him, and he got serious, and in a respectful tone asked me if I was serious. Thus he always comes into my memory, ironic as the priest’s pardon after confessing sins, and as sweet as the tamarind that they give the leaders to taste. This year is the tenth anniversary of his physical disappearance. And every year, in spite of some mediocre political and cultural figures who agree to forget him, the imprint of Guillermo Vidal on Cuban culture overrides frontiers and political regimes. And this is elaborated with the passage of time, which was the only thing he didn’t laugh about. To struggle against time through writing was an exercise on which he bet his life. Please follow the link and sign the petition to have Amnesty International declare the Cuban dissident Angel Santiesteban a prisoner of conscience.